An amazing adventure awaits you as you travel round trip from Sydney, on a route that is completely different going back! Stops in Katoomba and Bathurst take you through the Blue Mountains, exploring the history of gold mining, the Abercrombie caves, and numerous historic sites. On to Dubbo and the Western Plains Zoo, and then the "Australian Country Music Capital", Tamworth, followed by a half-day's drive west to the coast and up to Coff's Harbour to see the dolphins. The final days of your travels take you to Port Macquarie's vineyards, to Forster and the Myall Great Lakes area, the coastal villages of the Port Stephens Region, on to Cessnock and the famed Hunter Valley Gardens, finally arriving in Sydney for some city fun. The first leg of your adventure takes you 102 km west (almost 2 hours) to the bushwalking capital of the Blue Mountains, the cliff-side town of Katoomba. Just north of the Blue Mountains National Park, Katoomba looks out on the Three Sisters. Adventure sports such as abseiling are available, or you can take bus or scenic rail tours. Today you will drive about the same distance as the first leg, just under 100 kilometres (about an hour and a half) on the Great Western Highway to Bathurst. Bathurst has several National Trust houses you can tour, including the Abercrombie House mansion, the pioneer-era Miss Traill's House and the simple home of former Prime Minister Ben Chifley. Gold was first noticed here, and gold mining, industrial technology and transport make up a big part of Bathurst's history and made accessible in its museums. Today you head 205 km west, and then north on the Mitchell Highway. In just under three hours you will arrive in Dubbo, a fast-growing town at the center of NSW, where you can shop at galleries, visit a winery and even learn to throw a boomerang. Three government astronomical observatories are close by, and Dubbo is home to one of the world's premier zoos. Jedda Boomerangs has been handcrafting boomerangs for years and have been showcased on several television shows. Watch the artisans make boomerangs, then learn to throw one. The shop has many other local arts and crafts. Allow 4 ' hours to get to Tamworth. The 342 km drive takes you north-east, first on Newell Highway, and then on Oxley Highway. Tamworth is the Australian home of country music. Tamworth is friendly and close to nature, boasting the Kamilroi Walking Track and the Oxley Scenic Lookout (great for a picnic) as well as famous bird watching trails. Gamilarart Gallery Co-operative Limited is a gallery where 55 local indigenous and non-indigenous artists exhibit their work, which has won many awards. The Gamilaroi or Kamilaroi people live west of Tamworth. You will be able to see modern Aboriginal art and its influence. Today you are heading to the coast, as you drive 422 km east on the Oxley Highway and then north the Pacific Highway. After a 5/12-hour drive you will reach cliffside Coffs Harbour. This seaside town has wonderful beaches for swimming, surfing and fishing; rivers for white-water rafting and a glorious botanic garden. Coffs Harbour was voted one of Australia's most livable cities, and boasts a wide variety of outdoor activities, including some of the best scuba diving off the Solitary Islands and accessible rainforest at Dorrigo National Park. Jetty Beach near the Marina is protected by a breakwater and offers calm conditions for swimming. Park Beach is open and offers great surfing, with some sheltered areas for swimming. Boambee Beach is also open. Check locally about safety patrol conditions. Today's drive is 163 km (about two and a half hours) south on the beautiful Pacific Highway. Port Macquarie, at the mouth of the Hastings River, is a Mecca for water sports. The Hastings and Camden Haven Valleys are scenic wonderlands. Port Macquarie is rich in history, too. St. Thomas Church is one of the oldest in Australia. Begin your visit to the Sea Acres Rainforest Centre with a stop at the ecology display to deepen your understanding of the flora and fauna and how they interact. Then take the long boardwalk to see the rainforest up close. You can purchase a souvenir or educational material at the shop, and dine at the Rainforest Caf'. Drive 110 km south (around an hour and a half) on the Pacific Highway to Forster. Situated on Wallis Lake with both the Tasman Sea and the Myall Lakes nearby, Forster is a paradise for water lovers. Whether sun-bathing on the golden sand beaches on the coast, or fishing in one of Australia's Great Lakes or swimming with wild dolphins, this is a place to relax and enjoy your stay. Many marked trails are available, from walks through rain forest to wild flower walks to birding adventures. Myall derives from the word for 'wild' in the local aboriginal language, and you can find your own touch of wilderness in the park. Take Mungo Brush Road via Hawks Nest, as it sealed all the way to the ferry. At the corner of Little Street and Memorial Drive in Forster, you will find Dive Forster at Fisherman's Wharf. You can charter a boat for snorkeling or diving, take diving lessons, or, best of all, swim with wild dolphins. Dive Forster offers the only cruise on Australia's east coast that is licensed to let you swim with dolphins. The first oyster lease in Wallis Lake was granted in 1884 and the local Wallamba oysters deserve their great reputation. Enjoy fresh oysters and fresh seafood after a stroll along the Breakwater, where you can see pelicans and other sea birds. 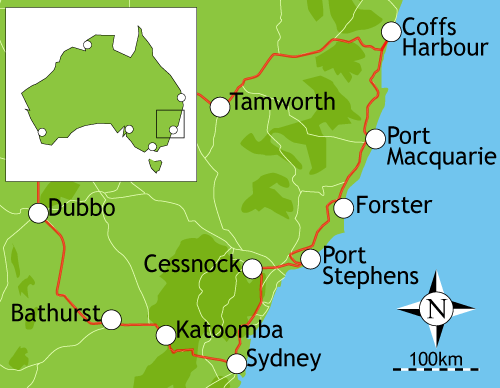 Drive 168 km (around 2 and a half hours) south on the Pacific Highway to the Port Stephens Region. Port Stephens is linked to the Lakes Area by the Myall River and sits on one of the finest bays in Australia. Water sports are widely available and the area terms itself the 'Dolphin Capital of Australia.' Humpback whales pass through on their migrations. Tomaree Head marks the beginning of Tomaree National Park, where you can find war relics and over two hundred species of birds. Stockton Beach has 32 km of dunes. Enjoy great fishing and watch seabirds at the water's edge. Watch professional fishermen work their nets. Find a shell mound left behind by the Aboriginal Woromi Tribe. Grab a piece of cardboard and slide down the steep side of one of the dunes. This is the largest mobile continuous stretch of sand in New South Wales and it has been covering and revealing forest for over 6000 years. Do watch for barbed wire and tank traps'relics of World War II. Lieutenant Caswell built this stone house in 1831 as a home for a sailor on the waterfront. It has a little gaol (it was built by convict labour), an elaborate gazebo and an ancient olive tree. If you are lucky you will see the ghost of Elizabeth Gray who was a governess here shortly after the house was built. Tanilba House is in the midst of a koala habitat. If you would like to know what some of the shells you have found on the many beaches you visited on this tour, stop at the Port Stephens Shell Museum. You can identify your finds and see some of the rare shells you didn't find. Souvenirs are available in the gift shop. This next leg is a short one, just 85 km (one hour and forty minutes) southwest. Cessnock is the gateway to the Hunter Valley Region, one of Australia's oldest wine-growing regions. Cessnock began as a traveler's rest on the convict-built Great North Road and is now surrounded by history. Make your way back to your starting point, heading south 151 km (about two hours) and mainly on the Pacific Highway. In Sydney, you can indulge in some of the Emerald City's 'Mod Oz' cuisine and a little of the city's famous nightlife. This is where you may wish to extend your trip once you return your rental, and stay at a hotel in the Rocks Historic District long enough to take in Sydney's many world-class attractions. Enjoy a tour of more than 45,000 plants at this 80-acre park. You can also explore on your own, but do make time for the Rare and Threatened Plants Garden, and a meal in the Botanic Gardens Restaurant surrounded by flowers. Return your campervan and begin working on that scrapbook!